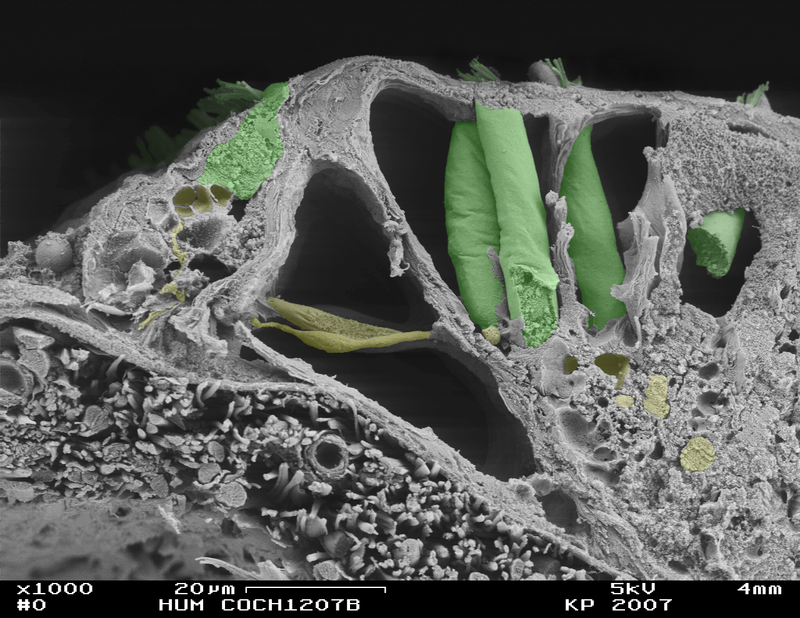 Every day I get reminded of just how amazing the cochlea is (the picture at the top of this post is from inside the cochlea!). Today I wanted to share with you some of my favorite facts about the ear. Sound waves are almost everywhere. But even though your brain is a really amazing organ, it alone isn’t able to recognize sound waves. That’s the job of the cochlea! The cochlea is the innermost part of the ear and connects directly to the brain. When the ear picks up sound vibrations they’re sent through different parts of the ear and into the cochlea, in the same way that a funnel directs liquid. In the cochlea these sound vibrations are turned into little electrical signals that go straight to the brain. Then, the brain’s nerve cells take over and you perceive the sense that we call “hearing.” And all of this happens almost instantaneously. Each cochlea is incredibly tiny. It’s about the size of a pea and from the outside looks like a tiny little snail shell. But inside of this tiny little organ are all sorts of little structures that work together to turn sound into hearing. They’re all rolled up into a spiral, but if you would unroll an average cochlea it would end up being a tube about 31.5mm long. This tube can be a few millimeters wide at the base, but towards the very top it shrinks to mere fractions of a millimeter. Within this small distance is everything that your body needs to turn sound vibrations into hearing. Just because it’s tiny doesn’t keep it from being filled with all sorts of special cells. In fact, there are over 20,000 hair cells that are entirely responsible for receiving sound waves and turning them into hearing. Check out the photo at the top of this post to see what they look like: the green parts are just a few of these 20,000 cells. And to give you a sense of scale, each of the green cells is less than 20 micrometers long (0.0007 inches)! The little hairs on the very top vibrate back and forth in response to sound waves, and then these vibrations are turned into electrical signals within the bigger green parts. The yellow parts are part of the auditory nerve, and are like the roads that send these electrical signals straight to the brain. All 20,000 of these cells are spread along the distance of the cochlea, or about 31.5mm. But if you stimulate two different hair cells that are far apart, you would hear two completely different sounds. This happens because of the way that the hair cells are arranged along a membrane within the cochlea. The membrane is short and stiff on one end so it only responds to high-pitched sounds (like a bird’s chirp), while the other end is longer and more flexible so it only responds to low-pitched sounds (like the beat of a drum). This is called “tonotopy,” and it’s so cool that it deserves a story all on its own – more about that another time! The membrane vibrates, but it doesn’t vibrate in air. Instead, the part of the cochlea that touches these hair cells and the membrane is filled with a special fluid called endolymph. Because this fluid is heavier than air, it moves with more force so that the hair cells and membrane can work more efficiently. It’s a lot like the difference between having a summer breeze in your face and being hit by a strong wave along the beach. Have you got a question about the cochlea or do you know something about the cochlea that we haven’t covered?